Perhaps it has its roots in my childhood, when my Mum wouldn't let me buy secondhand books because "you don't know where they've been and they're full of germs!" Whatever the reason, as an adult I've always loved old books and, once I was old enough, began to collect them. Inevitably, not all of the ones that interested me were in pristine condition, but for a long time, there was nothing I could do about it. 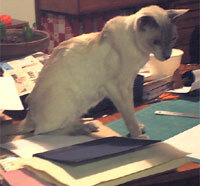 Then I heard that bookbinding classes were available in my area. Take a love of old books, a liking for handicrafts and a convenient bookbinding class and you have a match made in heaven! That's how I got started back in the 1980s. Bookbinding isn't a quick operation, each stage needs care and attention, but there's a tremendous satisfaction in turning a tattered old volume into a smart book once again. Over the years I've gradually acquired my own equipment and now have all the resources I need to bind books from start to finish. For me, bookbinding is and always will be, primarily a hobby, although I'm beginning to wonder just how many more bookcases I can fit into my house! I'm gradually building up a collection of old cookery books and was delighted when I picked up a rather battered copy of Mrs Rundell's "Domestic Cookery" very cheaply. She was in a bad way when I first found her, but she's scrubbed up a treat! I was able to save the old spine and the engraving on the front cover and re-use them. The cover engraving has been inlaid into the full leather binding. The headbands are hand sewn. The Juvenile Travellers had no spine at all when I first met them. Published in 1811, the book had been bound as cheaply as possible with a paper spine and blue paper boards, so it was amazing that it had lasted at all. It's now been half bound in green calf and finished with hand marbled paper. As is clear from the "before" picture, the spine actually tilted and this has been disguised so that the top now appears level. A brand new binding is only half the story. Sometimes an old binding can be restored. I collect the annual volumes of the Girl's Own Paper and was lucky enough to pick up several volumes very cheaply when the owner of a bookshop was selling off his stock. I hadn't intended to buy this one, but in the end, I felt sorry for it left all alone on the shelf and brought it home with me. Many, many hours later it was, once again, looking smart. If I were to convert the hours I spent working on it into an hourly rate, the cost would run easily into 3 figures, well in excess of the book's value, which isn't high, so it wasn't a cost effective exercise, but I don't care! A new case was made for this book, with some of the original cover inlaid. Antiquarian books are more likely to have had a whole or partial leather binding. Rebinding using leather is more time consuming, but the end result is far more attractive than a plain cloth case. A quarter leather binding is when the spine is leather and the rest of the boards are either cloth or marbled paper, although it is not a good idea to used marbled paper in this instance as it is not as robust as cloth and the corners are likely to wear much more quickly. Books can also be quarter bound in cloth rather than leather. This can look very effective if contrasting cloths are used for spine and boards. A half leather binding is when the spine and corners of the book are leather and the rest of the boards are either cloth or marbled paper. See how it's done HERE As in the quarter bindings, cloth can be substituted for the leather. 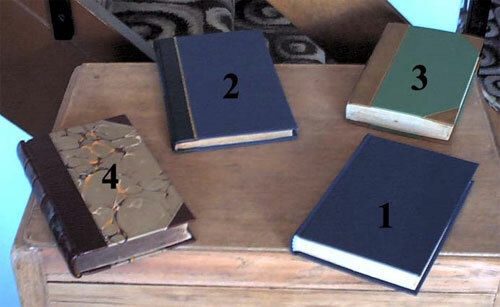 Three quarter bindings aren't seen very often and the term is often mistakenly used to describe a half leather binding. Instead of just the corners being reinforced with leather, a strip of leather, is put down the entire outer edge of the book. A full leather binding is exactly what it says, the whole of the case is covered in leather. Some old leather bound books have raised bands on the spine, some don't. The practice originated because up until the early 1800s, books were sewn onto cords which stood proud from the spine. The leather in those days was glued directly to the spine and moulded round the cords, creating the bands. In the early 1800s, it became the practice to make sawcuts in the spine and the cords rested in these, so that they no longer stood proud, although the leather was still glued directly onto the spine. Later still, a new technique was introduced which avoided glueing the leather directly onto the spine and thus added strength and durability to the binding. This technique is still in use today. Raised bands, if still desired, are now created artificially. The convention these days is to have 5 raised bands on a spine, although if you look around a secondhand bookshop you will find that not all binders actually follow convention. Not the best picture of me, but a good one of my "supervisor"
Please note, at the moment I am only taking commissions from previous customers. Sorry! Although this is my hobby, I do like the idea of making it self-financing. I'm not looking for a lot of work, but an occasional commission every now and again would be welcome. The prices shown are a guide only. They are for basic rebinding of books of average size ie roughly 8" x 6" x 1" (20cm x 15cm x 2.5cm) with plain endpapers and a title on the spine. They do not include restitching, paper repairs or any other specialised work. Whilst they do include leather, this would normally be goatskin. 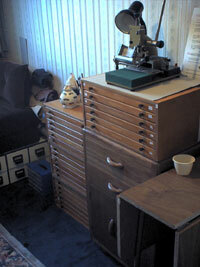 Please note 11" x 8½" x 3" ( 28cm x 21.5cm x 7.5cm) is the maximum size with which my equipment can cope. From 7th June 2009 20% of the prices quoted will be donated to PDSA, Britain's largest veterinary charity. For more information about my involvement with PDSA click here. Sadly, after a very long and active life, my "helper" is no longer with me. There are no prices for repairs as, particularly with leather bindings, it's not possible to assess the work involved sufficiently well from pictures, so I prefer not to take them on. Once a book is finished, I will email you pictures of it. On receipt and clearance of your payment, either by cheque or via Paypal, I will return it to you via Royal Mail's Recorded Delivery. If you live locally (North East England), you are welcome to call round. Postage and packing will be at cost. The small hot foil printer I use for titles. Despite its size, I've had some success decorating spines, although it takes a lot of time and patience and is not included in the bookbinding services I offer. Will the value of my book increase? That depends. The value of an antiquarian book in poor condition will certainly be increased if it is sympathetically rebound, although it will never come close to the price of the same book with an original binding in good condition. The cost of a rebind or repair added to the price you paid for the book, may still come to more than the book's worth. Modern books in bad shape are really only worth rebinding if they have a value to the owner that isn't financial. Why repair instead of rebind? I don't believe in rebinding for the sake of it. Sometimes it is only the spine of a book that is damaged. It is often possible to replace this, but to keep the original boards. If a book is old, it will have a greater value if it has been successfully repaired than if it has been completely rebound. 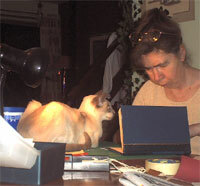 It can take as long to complete a repair as it does to rebind a book. When is hand marbled paper appropriate? The quick answer is "whenever you choose", although it can look inappropriate on some modern books. The first machine printed marbled paper started to appear around the mid to late 1800s. Prior to that it was all hand marbled, and I always think it is a shame to replace original hand marbled paper with machine made. The colours of hand marbled paper tend to be brighter and more vibrant and can be quite a surprise to those used only to seeing faded 200 year old hand marbled paper. What is millboard? The boards of books are normally made from ordinary greyboard and this is perfectly adequate. Millboard is similar to greyboard, but much denser. The corners of a book are less vulnerable to damage over time because of its greater strength. It is useful if the book requires a strong cover with minimum thickness. Some prefer millboard rather than greyboard on leather bound books. Why do books have headbands? Most people, when they remove a book from a bookshelf pull it out from the top of the spine. The headbands strengthen this part of the book, particularly when the spine is leatherbound and the leather extends over the top of the headband. My "speciality" is hand sewn headbands, simply because I enjoy doing them and can co-ordinate the colours I use more precisely with the rest of the binding. If you would like a quote, email me some photos, together with a description of the book including size and condition and the type of work you would like me to do. I can scan and email samples of marbled papers, cloth and leathers although I cannot guarantee complete accuracy as far as colour reproduction is concerned.